This may or may not be the same event reported in the story, but it fits the description. The autos indicate a date in the late 1920’s. 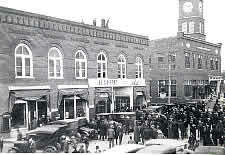 Note the watchers on top of the Store Building. Cliffside, October 29 — When seen late this evening John G. Roach, the manager of Cliffside Mills Store, in speaking of the great sale which ends tonight, said he was highly pleased with the results. Many people, he continued, had come from long distances and had gone away well satisfied with their purchases; not only were there people from all parts of Rutherford County, but adjoining counties as well. On the opening day of the great Sale, Mr. Roach said, there had been a special feature and when the doors were opened he estimated that there were over five hundred awaiting. Many of the employees, and others not connected with the store, thought the crowd on the first morning was between seven and eight hundred, but he, Mr. Roach, preferred to under rather than over-estimate. Mr. Roach attributed much of the success of the sale due to the advertising he had done, though, he added, it was of course necessary to have the right goods to sell. This item was printed in The Sun on October 29, 1927.